Air camping e Van: get back to basics! Are you interested in trying out some back-to-basics air camping in Sardinia? We will be delighted to welcome you to Camping Cala Ginepro, in the municipality of Orosei. Amid the marvels of the Gulf of Orosei, you can enjoy a wonderful holiday in Sardinia with your vehicle and your preferred accommodation solution! In the campsite’s lush forest, the towering pines and perfumed juniper trees offer shaded pitches that satisfy an array of different requirements; and during the less busy periods, such as spring and autumn, you can get lower rates and have a greater choice of pitches. 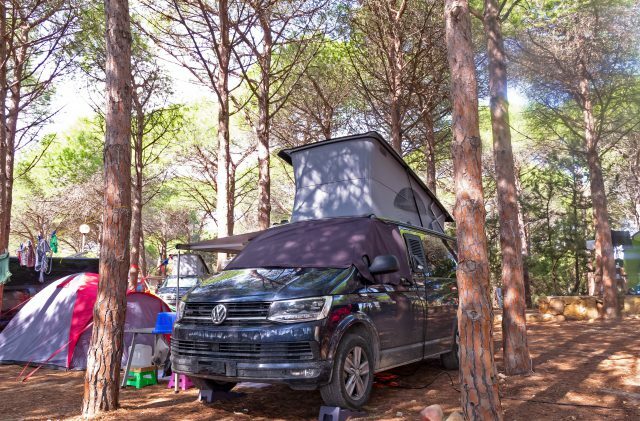 At Camping Cala Ginepro, if you like air camping and taking your van on holiday with you, you are sure to experience a unique open-air break, surrounded by an untainted natural environment but with no compromise on amenities. Did you know….that “air camping” is based on an Italian patent? Today, the term is used more generally to denote the use of a tent mounted on the roof of a vehicle. Whether you prefer air camping or sleeping in your van, you will be able to get right up-close and personal with nature – camping doesn’t get any purer than this! Alongside the convenience of the plethora of free facilities, the campsite offers myriad opportunities for fun, sport and adventure!